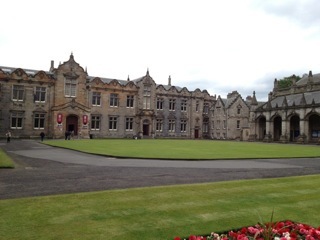 This week Alvina On, Dave Barnes and Idunn Jacobsen all PhD students at MSSL blog about the experience of attending the UK National Astronomy Meeting 2013 in St. Andrews, Scotland. 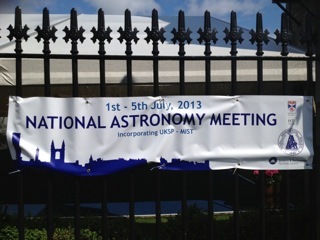 This year’s National Astronomy Meeting was located in a (partially) warm and sunny St. Andrews, Scotland, between 1st and 5th of July. With a programme incorporating a wide range of research areas, with talks ranging from Solar physics to Cosmology to the future of instrumentation, a reported 600 registered astronomers and space scientists descended on the quiet, coastal town. We arrived on Sunday evening, which we spent getting familiar with the town. It is usually dominated by students attending the university. However, due to the summer holidays, the town centre was very quiet, and our accommodation was a 20 minute walk out of the centre, so it was even quieter. Between Monday and Friday we enjoyed a packed programme, with parallel sessions, plenaries and public talks. 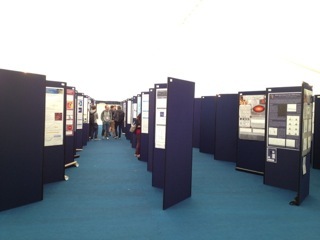 The frequent coffee and lunch breaks allowed attendees to meet and greet fellow researchers, engage in discussions both within their respective fields, as well as across areas, and to view the many posters that were complimenting the talks of the parallel sessions. The poster room at NAM. With a large fraction of sessions this year allocated to UK Solar Physics (UKSP) and Magnetosphere Ionosphere Solar-Terrestrial physics (MIST) meetings, it gave us from the numerical and theoretical corners of large-scale astrophysics a glimpse of astronomy on much smaller scales than we are accustomed to. The opportunity to speak to fellow PhD- students and astronomy researchers from other institutions was great, not only to discuss the science being done, but to have the chance to discuss career paths and progress, and the general news from the science community. A number of social events allowed everyone to meet in more relaxed settings, such as the Whiskey tasting event. This provided both the history of Scottish Whiskey, by Dr David Wishart from the host university, and, equally importantly, ample choice in whiskies – arranged by taste and complexity analogous to the Hertzsprung-Russell diagram, for the benefit of the audience. The conference programme commenced Monday afternoon, with registration and a plenary talk to ease us in to the week ahead. Mike Thompson from HAO Boulder gave an insight into the study of the Solar interior, including the methods of helioseismology and modelling as ways of learning more about the parts of the Sun which cannot be reached by traditional means of detection. Tuesday’s plenary talks were on cosmology, with a special focus on the recent results from the Planck satellite, from the theoretical point of view by UCL’s Hiranya Peiris, leading us through the process of obtaining the CMB map to the current 6-parameter cosmological model, and from an observational perspective by Catherine Heymans of ROE Edinburgh, emphasising the puzzle of the dark Universe. Wednesday’s plenaries were dedicated to astronomy at slightly smaller scales: first was Rob Kennicutt Jr. (of the Kennicutt-Schmidt relation) from IoA Cambridge – who, in the morning after a night of whiskey tasting, gave an insightful talk on star formation in the Universe, and down to galactic scales, promoting upcoming data from ALMA to greatly help fill in the unknowns, especially star formation at high redshifts. In the afternoon, we continued on galactic scales, with a discussion by Andy Lawrence of ROE Edinburgh (aka the eAstronomer) on the science done with mega-surveys, focusing around AGN and the high redshift quasar population, such as the furthest quasar known to date (at a redshift of just over 7). Its massive black hole leaves us wondering how it was able to form so early on in the history of the universe, and welcomes the large quasar surveys of PanSTARRS, WISE, UKIDSS and SDSS (and we got a short reminder of the future with Gaia and Euclid). 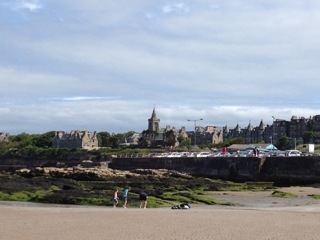 St. Andrews from the beach! The parallel sessions ran on average twice a day, and for each of the 11 parallel sessions, we had about six topics to choose from. The areas of science presented in each were from all corners of research represented at the conference, thus for an astrophysics PhD student, the choice would primarily fall on the most relevant session in the group. A number of people from Astro-group chaired and presented talks and posters, as did we – David and Alvina presented talks in the Heating & Turbulence session, which were received well and accumulated some good questions. In addition, David had a poster on his GCMHD+ code for cosmological simulations, for which he won the UKSP student poster competition! On the 5-hour train home, we’re leaving St. Andrews behind in bright sunshine, and look forward to next years NAM in Portsmouth !